OPPO, the Selfie Expert and leader, kick started the sale of its much awaited OPPO F7, the brand's first FHD+ Super Full Screen display model in India featuring the AI Beauty technology 2.0 and an industry's top 25MP front camera, on 9th April, 2018. With technology designed to personalize beautification for subjects on a selfie image, the phone is now available in numerous stores across the nation and is also available on Flipkart, Amazon and Paytm at a price of INR 21,990. The first sale for Diamond Black Edition will be on April 18th. 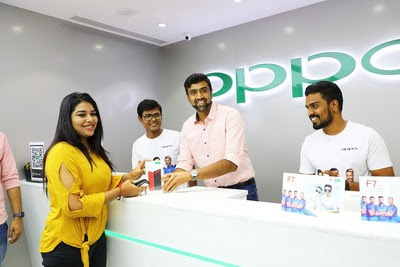 The kick off for the OPPO F7 saw the presence of Ravichandran Ashwin, Indian cricket team player who was recently announced as the Sports Brand Ambassador for OPPO, who was the store manager for the day. He was seen not just sharing his experience of the new Selfie Expert but also interacting with the first OPPO F7 customer and lucky OPPO fans. OPPO F7 is the first smart phone that brings Artificial Intelligence 2.0 into selfie feature in India with years of R&D. It identifies shapes and facial structures based on a global database and has around 296 facial touch points. Professional photographers and make-up artists were consulted during the R&D process, resulting in the AI technology having the ability to emulate those professional skills that can help selfies look more real and natural. OPPO F7 is the first phone that brings 25MP front camera for its consumer's flawless selfies powered by an Octa core 64-bit Mediatek Helio P60 Processor. The phone comes with a large 3400 mAh battery to support its 6.23-inch screen with an FHD+ display having a resolution of 1080 X 2280. The screen is also protected by a durable scratch resistant glass Corning Gorilla Glass 5. And for the rear camera, the 16MP rear camera is excellent for all day and night shots. The F1.8 aperture in the back camera also performs brilliantly for brighter and more precise shots in darker settings. Based on Android 8.1, ColorOS 5.0 has AI built into the software for better systems management. The ColorOS 5.0 AI power manager allocates processing power accordingly to the right app, making sure the phone runs at its best. OPPO F7's overall performance has been improved by 80% compared to F5; and supports AI, which is more accurate. Additionally, it also allocates power usage appropriately, extending the average daily usage of battery life, giving its users the best user experience for a selfie camera phone. OPPO is a camera phone brand enjoyed by more than 20 crore young people around the world now. For the last ten years, OPPO has been focusing on manufacturing camera phones, while innovating mobile photography technology breakthroughs. OPPO was the first brand to launch smartphones with 16MP front cameras. OPPO was also the first brand to introduce the motorized rotating camera, the Ultra HD feature and the 5x Dual Camera Zoom technology. In line with its deep insight of young people's behavior, OPPO first launched selfie-focused smartphones in 2015 - Selfie Expert F series in India and other markets. Its first batch of products received a warm welcome, and the brand leads the trend in the industry. In 2016, OPPO was ranked as the number 4 smartphone brand globally, according to IDC. In India, OPPO became the official sponsor of Team India, Men's and Women's National Cricket Team in 2017. It is also the official global partner of ICC in the mobile category for four years starting 2016. The market share of OPPO in India's offline market ranked No.2 in Dec 2016, according to GFK.